I chose this book for a very strange reason which I will blog about soon. The reason - to clear my head of my own prose before completing the last two drafts of my manuscript. I'm not in a position yet to decide yet whether this worked but if I go on to read the other two books in the trilogy - I'm guessing by then the answer will be yes. Because of course - as most readers of Banville know - he has a unique style that can be overwhelming at times. Reading his book The Sea was actually like being scoured by the sea, unrelenting wave after wave crashing over the reader and dragging them out into the depths of the ocean. At least that's how I felt after reading that wonderful book. This book I discovered was quite different. More like being gently lead into a strange garden full of interesting things by an unreliable fairy that flits this way and that. It's hard to keep up sometimes but the lyrical musings, the doubling back and the reminiscences are mesmerising. Banville's metaphors are to die for! "It was like clasping in my arms a big marvellous flustered bird that cooed and cawed and thrashed wild wings and shuddered at the end and sank down beneath me helplessly with faint woeful sounding cries!" "They have their own furniture, in their own world. It looks like the solid stuff among which I move, but it is not the same, or is the same at another stage of existence. Both sets of things, the phantom and the real, strike up a resonance together, a chiming." I can't go into details of course but the ending was a shock and ensures that I read the next book in the trilogy - Shroud. I thoroughly enjoyed this. My only criticism is that I'm unsure about what actually happened at the circus. 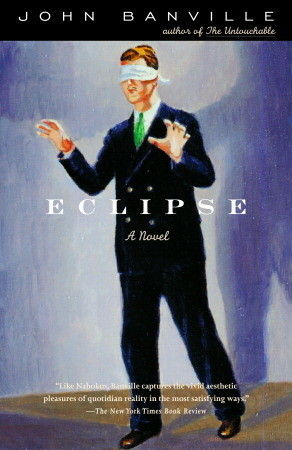 Sign into Goodreads to see if any of your friends have read Eclipse.